One of the most significant factors contributing to a child's quality of life is their ability to communicate effectively with their environment. The goal of the speech therapists is to help the children to use language through speech, or any other form of communication which is suitable to the child's age, abilities and needs. 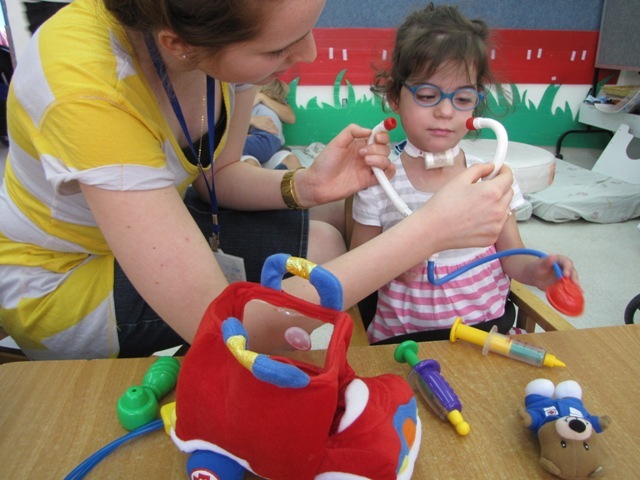 In ALYN's Speech Therapy Department, infants, children and adolescents dealing with congenital, developmental or acquired conditions undergo an initial evaluation relating to the use of language, speech and feeding function. Following the evaluation, a personalized treatment program is created, taking into account the child's abilities and needs. Language and speech – Difficulties with language and speech may express themselves through articulation, comprehension, and reading and writing skills, as a result of problems with functional movement and control over eating and swallowing functions, resulting from congenital conditions or acquired head injuries. Voice – Voice problems may manifest themselves through a hoarse or weak voice and respiratory insufficiency, as a result of brain injury, injury to the vocal chords or respiratory problems. 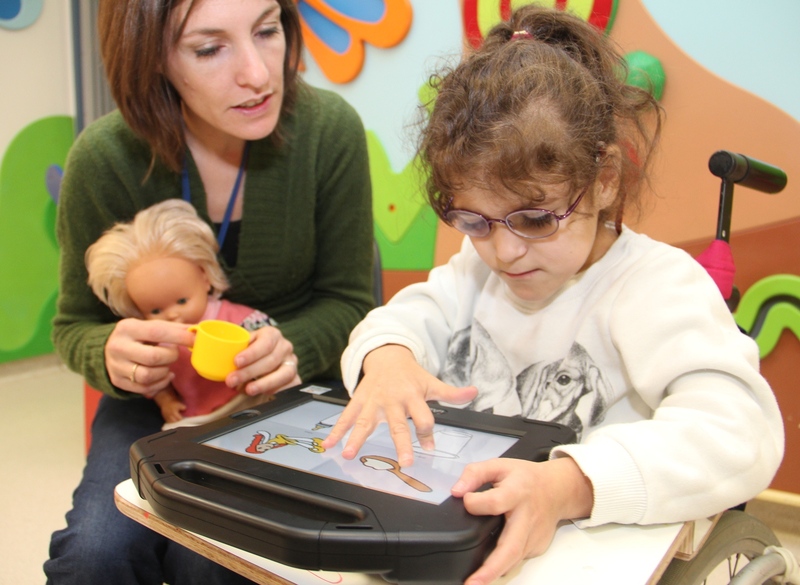 Augmentative and Alternative Communication -- In cases where a child cannot express themselves verbally, an alternative form of communication is created using state-of-the-art technology, i.e. communication boards, voice outputs and switches to activate them, or a computer with a communication program. This alternative communication is programmed to suit each child's particular needs and abilities. Eating and swallowing - Difficulties in eating and swallowing can manifest themselves while an infant is nursing, bottle feeding, going through the transition from bottle feeding to eating with a spoon, chewing and eating solid food, transitioning from alternative feeding to feeding by mouth, and difficulties in swallowing and selective eating. These difficulties can often be the cause of an infant's failure to thrive. Therapy sessions in the Speech and Language Therapy Department are personally suited to each child's needs and abilities. Staff members often work together during treatment with additional therapists from the ALYN’s multidisciplinary team. Department staff members treat children in the following languages: Hebrew, Arabic, English, Spanish and Russian. 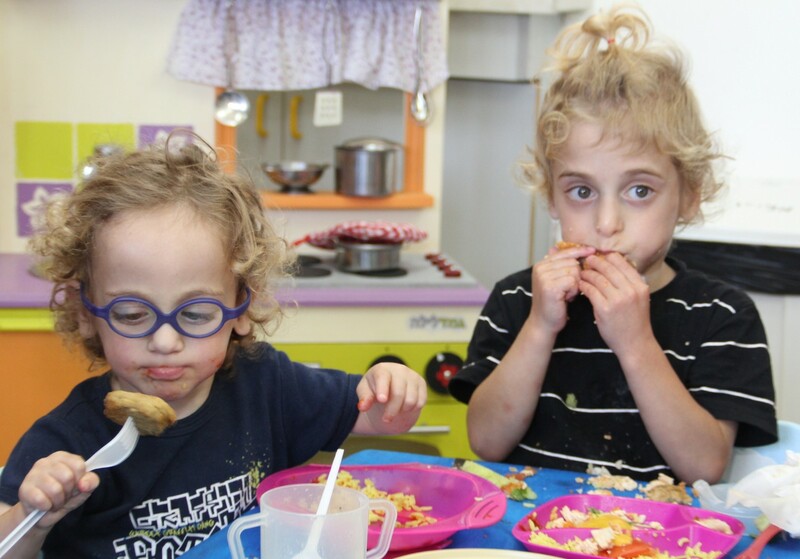 Group treatments – ALYN's speech therapists organize group treatments such as communication groups, pronunciation groups, language groups, supportive communication groups (using animals as a therapy tool) and an infant feeding group.